Gooseberries are botanically closely related to currants. Historically, they are popular in the British Isles. A classic gooseberry dish in Britain is a fool, made by folding cream into the stewed fruit. They can be eaten fresh or used in desserts such as pies, tarts and crumbles. Mature bushes can yield between 8 and 10 pounds of fruit. Early pickings are more sour and, therefore, more suitable as culinary ingredients. Allow the fruit to ripen for maximum sweetness. European gooseberries may be nearly as large as a small plum, but are usually less than one inch long. American gooseberry varieties tend to be smaller and perfectly round. Generally, European varieties have larger fruit and are more difficult to propagate than American but either type is easy to propagate by cutting or layering. They will often layer themselves if branches are allowed to lie on the ground and then the rooted branch can simply be cut off from the mother plant and moved. Hardwood cuttings can be planted in the fall, before all the leaves have dropped. Leaving some leaves on the top of the cutting can actually enhance rooting (take them off of the lower part). Bushes propagated from cuttings can begin to bear fruit within a few years. Gooseberries are easy to grow and drought-tolerant, but for best results should be irrigated in our dry summers. Excessive amounts of nitrogen in the soil make them susceptible to diseases. You can grow gooseberries as free-standing bushes, in hedgerows, or trellised in a fan shape. Pruning should strive to create open forms that let in light and leave room for both next year’s growth and easy harvesting. Since fruit is produced on the previous year’s growth, each spring some of the branches should be cut back to their growth point to encourage new growth, either near the ground or near the bottom of the fan in trellised plants. 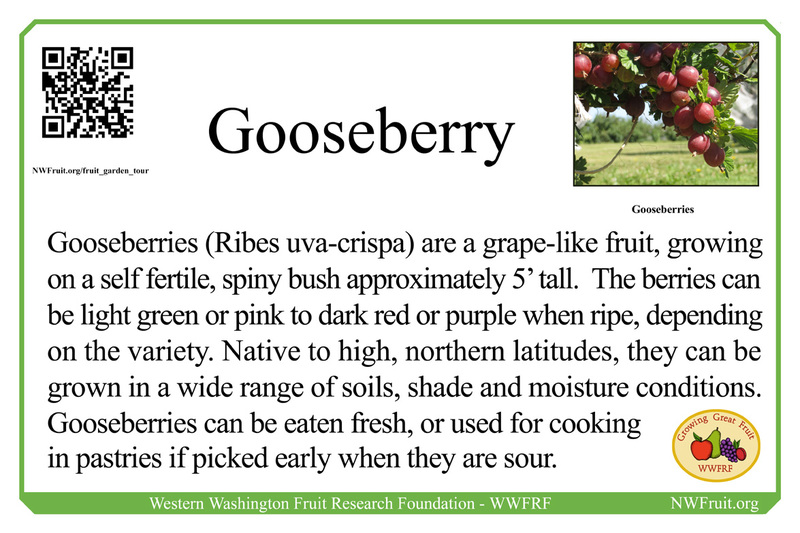 The gooseberry varieties grown in the Fruit Garden are Invicta, Hinomaki Red, Hinomaki Yellow, Leepared, and Poorman.